Waking up each day in your bed under the roof of your house, apartment, or whatever structure you call home may not seem like a privilege. To people who have homes, it just seems normal. But to those who have no such bed or roof, the word “home” has a different meaning. The thing is, most homeless people were not always without homes. A lot of America’s homeless population consists of people who once lived the same lives as average home owning American citizens. They had jobs. Better yet, they had careers. They had keys to their own front doors. They felt “normal” waking up each day in their own beds. The harsh reality is that anyone can become homeless at any time. Job security is not guaranteed in most fields. Mortgage rates are high. Missing payments can lead to incredible debt and foreclosure. More and more, people are finding themselves on the streets simply because they could not keep up with the fiscal demand owning a home can bear. It may be hard to believe that it could happen to you or someone you love. The stigma of homelessness makes it seem like all homeless people are drug addicts or deadbeats or don’t care about themselves. It is simply not true. A lot of the homeless are trying their best to find a home and a job so they can get their normal lives back. With the unfavorable stigma lurking, people tend to turn away when asked for help by a homeless person. We can only hope to shift the perception of the masses into realizing homelessness is not a choice most people make. It can be a consequence of many different factors. And it can happen to anyone. 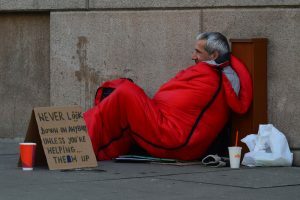 Offering help can not only give a homeless person the boost he may need to get back on the road to success, it can give him the confidence to get there without feeling less than worthy. Remove the stigma and help your fellow man get back on track.